As we are in our Summer Part Deux, is it possible to say that it is still “ice cream season”? To someone that would much rather be sweating hot than freezing cold, it is still warm enough to go out of my way for Red Mango. However, although Fall is shortly upon us, Brooklyn Farmacy and Soda Fountain is a reason to go out of your way for ice cream no matter what the temperature is outside. Brooklyn Farmacy is a family owned ice cream destination located in a beautifully restored 1920’s pharmacy offering an extensive menu of anything goes creations of ice cream treats. They offer sundaes with various bases such as buttermilk biscuits or different pies, custom made Whoopie pies with the ice cream flavor of your choice. They offer their rendition of The Elvis with candied bacon bits and a pickle and of course homemade egg creams (yes Mom, we can go) and floats again with you choice of ice cream. Although, normally I’d be hesitant to admit that I stuck with something “simple” or “basic”, I was far from dissatisfied and quite happy that I chose to have 2 scoops topped with bananas and a cone on the side. My 2 flavors were pumpkin (’tis the season) and coffee. This ice cream is so fresh and made from true ingredients – I was able to taste the actual pumpkin and the actual coffee used. It was delicious and satisfying! 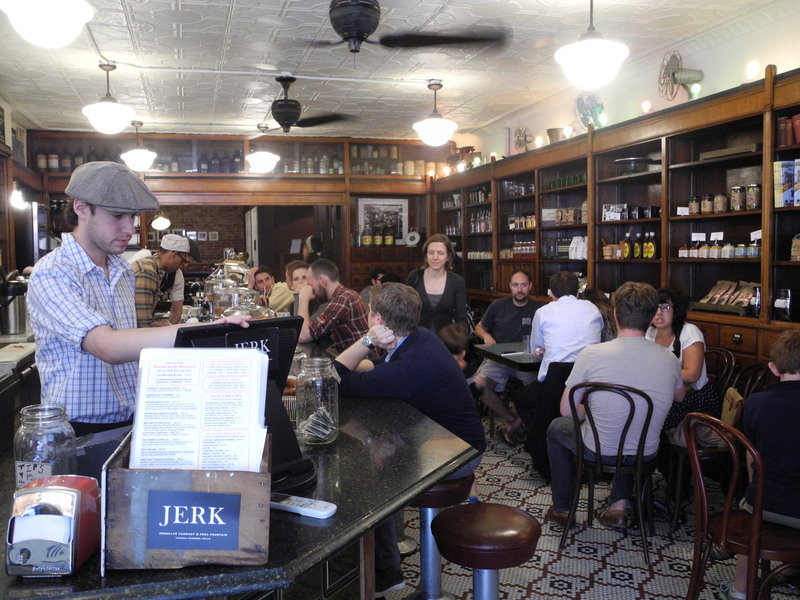 Brooklyn Farmacy also serves old school soda fountain savories. Whether you are in the neighbor or have the time to make a trip to Carrol Gardens, I SO recommend stopping in for some food and some dessert – any time of the year. This entry was posted in hungry? and tagged Brooklyn Farmacy & Soda Fountain, egg creams, floats, ice cream, sundaes, Whoopie pies. Bookmark the permalink.